How is October already half over?! It seems like we just blinked our eyes and half of fall has passed us by – and boy oh boy has it been hectic. Between shutting the restaurant for the season, managing the social media for the Martha’s Vineyard Food & Wine Festival, and catching up on recipe developing for clients, it’s been over a week since I posted a new recipe on the blog! Grab a comfortable seat and a big, delicious slice of this awesome Spiced Apple Pumpkin Snack Cake and let’s catch up! Once October hits, the season on Martha’s Vineyard slowly comes to an end. Restaurants shut down for the season, shops tuck themselves in for the winter. My husband and I plan winter trips to get us through the cold season; it’s the seasonal lifestyle of work-work-work and then much deserved relaxing. But someone, this month, I’ve been busier than ever. New clients have appeared, new projects have developed – a new horizon for me, dare I go back to the restaurant kitchen next year? Maybe. In the meantimes, you need to make this cake. 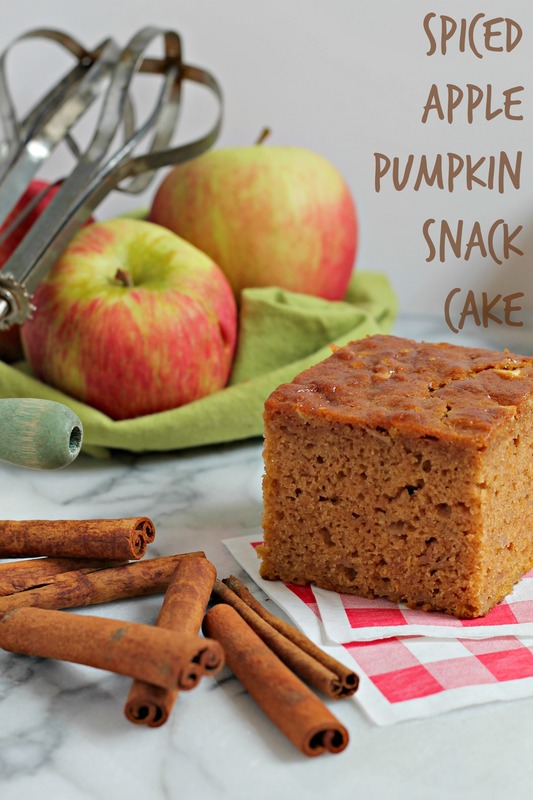 This Spiced Apple Pumpkin Snack Cake is just that – a snack cake! What’s a snack cake you ask? Basically a cute name to call a cake, to make it a bit more casual and not so “cake-like”. It’s a cake that takes only two bowls and a whisk to whip up, keeping it sweet and simple as far as cakes go. Deciding to keep this simple and not slather it in an uber-sweet frosting or icing, a sprinkling of powdered sugar should suffice. The fresh apples are grated to maintain some structure, plus they add such great moisture, flavor, and texture to this little cake. Packed with pumpkin puree and the sweet apples, plus a touch of pumpkin spice blend, it’ll become your favorite autumn cake! This Apple Pumpkin Snack Cake is a simple and quick recipe for when you need a seasonal dessert that's not time consuming and still tastes amazing. Plus, it will make your home smell amazing. Preheat oven to 350F and lightly oil an 8x8 inch square baking pan. In a large bowl, whisk together the flour, sugar, spice blend, baking powder, baking soda, and salt. Set aside. Pour batter into greased pan and bake for 35-45 minutes, until golden brown. Serve warm or room temperature with a sprinkling of powdered sugar.